Stress reduction and lessening of anxieties for teachers, students, with focused breathing practices to teach resilience, empathy, compassion and loving kindness. 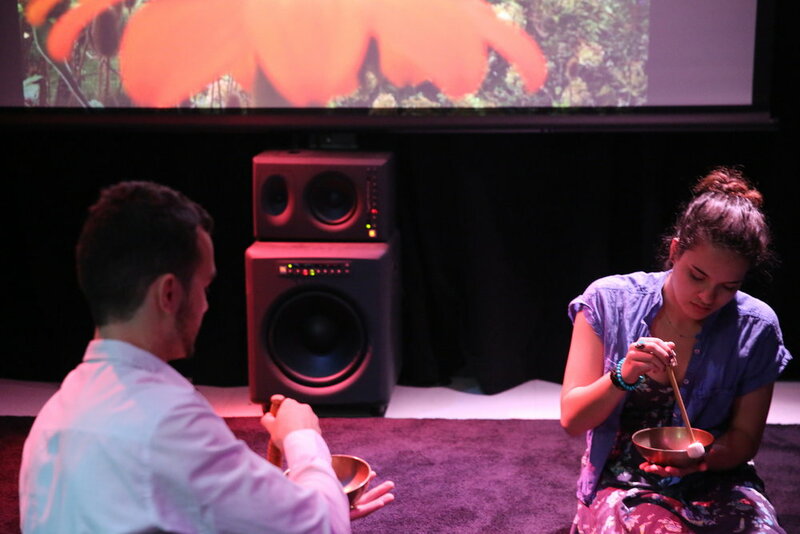 Differentiated Mindfulness™ practices establish deep mind/body integrated connections through curated mindfulness and meditation workshops and interactive media. These combine ancient knowledge with the newest instruments and methodology. They provide creative environments with acoustic and audiovisual immersion and mindfulness tools; great for teachers to de-stress in their work day and for students to learn calm and how to focus better with confidence. 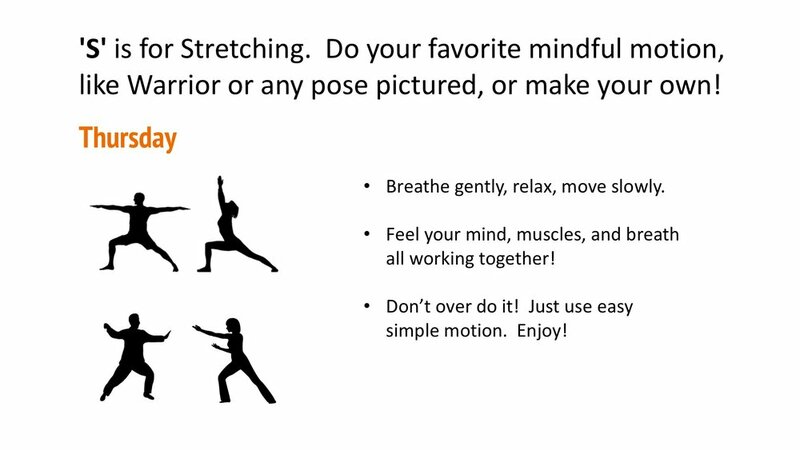 Differentiated Mindfulness™ practices establish deep mind/body integrated connections. You breathe, listen, see, speak, vibrate, feel and communicate within a mindful framework. To bring wellness into everyday practice, we engage and educate individuals and groups, leading in mindfulness, stress reduction, mind-expansion and calming techniques, through a differentiated, customized approach. We specialize in mindfulness meditation, sound therapy, immersive audiovisual guided meditation, and storytelling. We cultivate creative expression through personal training and self-healing environments that connect the mind and body. Our curated practices engage in both scientific and wisdom based principles. This creates environments that promote well being, harmony, compassionate thought and action. I customize mindfulness curriculum, and offer enhancements to existing curriculum to get more buy in, run professional development retreats and in class lessons on ways to use mindfulness practices. Your school can benefit. Here are a few possibilities! 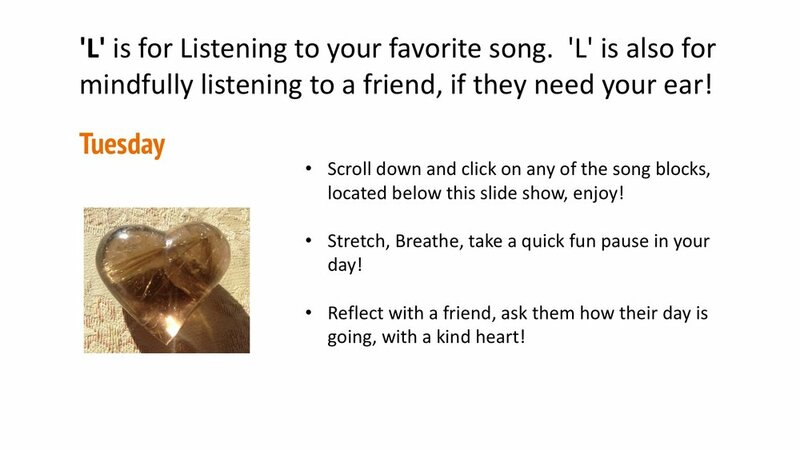 • working with your wellness, guidance and student success teams on effective ways to incorporate mindfulness. • mentoring student councils on mindful leadership, mindfulness concepts and peer implementation. • establishing expanded, age appropriate classes for lower, middle, upper division students. • leading mindfulness community assemblies, and meditation clubs. • facilitating workshops on stress reduction and reducing academic or social anxieties. • parent’s association introductions on family mindfulness best practices. • offering professional development training for teachers on mindfulness based classroom lessons. • creating ambient audio or visual tools for better classroom learning. • introducing meditation to philosophy classes and introducing other curricular tie ins. • individualized, inter-active, mindfulness web pages. Awareness of breath, using your mind and intent to direct the flow of breathing, conscious breathing for healing, centering, grounding one's self and better focus. We offer practices encompassing simple breathing exercises to restore, relax, calm, and enhance each moment. The breath can be used to bring about wellness. There are some times you can go without water food or sleep, but not without breath! Practicing Mindfulness allows us to feel the natural joy in breathing. Discover alternatives to falling into the trap of using your voice for purposes of mis-communication and cynicism. Explore the power of your voice, compassion, and kindness, and allow yourself to say what you feel in a depersonalized way. Transformational for working teams, parent/child relationships, couples or inner conversation with the nature of your true being. of listening focuses on the harmonies and rhythms of your body, mind and surroundings, creating holism and wellness. The world is sound. By awakening our 'Sound Body', you become aware and can tune into your internal flow of life force, to recharge, revitalize! Everything in the universe vibrates. Each cell, each molecule can deeply re-energize. By using music and sound tools that have unique acoustical qualities you resonate and create sublime states of calm, with profound effects. They entrain your central nervous system. You re-align, attain deep relaxation, and are able to reprogram neurological paths, making imprints to enhance both sleep and waking moments. Awareness of sight, to see beyond objects and discover their true nature, one experiences inter-being. If each moment is viewed in a non-judgmental manner it allows that which is illusion to flow past and your focus begins to calm. Sight and thoughts are like rivers within you. At first they rush, like a waterfall but with practice they become still, like an ocean with no waves. It is in these moments of stillness that you awaken your innate 'Buddha nature', feel joy and compassion, which connects you with all beings, to see subtle magic and wonder. The boundaries of self begin to dissolve and you start to connect deeply with what or who is around you. To teach contemplative practices of Mindfulness is truly a beautiful virtue. Whether receiving or giving, to understand and benefit from the lineage of these aspirations will deepen your awareness. By embedding this knowledge into your daily practices you gain wisdom. Knowledge in itself is subject to momentary accuracy. Understanding of impermanence, separation of yourself from your thoughts, compassion and unconditional love, giving and receiving, will open your mind and create new clarity in its approach. You begin to balance emotion, gain lifelong skills of true joy and share in the benefiting of others. A neural circuit in the brainstem plays a key role in the breathing-brain control connection. This circuit is part of what's been called the brain’s “breathing pacemaker” because it can be adjusted by altering breathing rhythm (slow, controlled breathing decreases activity in the circuit; fast, erratic breathing increases activity), which in turn influences emotional states. Simple controlled breathing exercises help to regulate the circuit. Stress is another area where the evidence is particularly convincing. Continued mindfulness practice results in significant lowering of activity in the amygdala, the part of the brain that triggers the freeze- fight-or-flight response. This helps to create calm. Slowing your breathing increases “baroreflex sensitivity,” the mechanism that regulates blood pressure via heart rate. Over time, using controlled breathing to lower blood pressure and heart rate may lower risk of stroke and cerebral aneurysm, and generally decreases stress on blood vessels (a big plus for cardiovascular health). Studies have revealed that mindfulness practice improved concentration and reduced mind-wandering. The researchers also found that mindfulness had a dramatic effect on working memory—the facility we have to manipulate stored information in order to reason and make decisions in a timely manner. One group of students that underwent a two-week course in mindfulness training boosted their scores on their GREs—the graduate school entrance exams—by more than 30%. Research on mindfulness practice has shown an enhanced ability to self-regulate cognitive, emotional and behavioral responses. It is postulated that self-awareness (arising from increased attention to the moment-to-moment experience) and acceptance of experiences play a crucial role in self-regulation. Neural Mechanisms research suggests that mindfulness practice is associated with neuroplastic changes in the anterior cingulate cortex, insula, temporo-parietal junction, fronto-limbic network and default mode network structures. This is what allows for improved self-regulation. Further, on the brain, meditators show increases in left-sided anterior activation (a pattern associated with positive affect (Positive affect refers to the extent to which an individual subjectively experiences positive moods such as joy, interest, and alertness).) and changes in grey matter concentration within the left hippocampus (grey matter here is associated with verbal memory, learning and memory). Additionally, research supports improvements in neural processing related to attentional core processes with as little as 10 to 15 minutes of mindfulness-based meditation a day. A systematic review of more than 20 randomized controlled trials in 2011 successfully demonstrated improvements in overall mental health, as well as its benefit for reducing risk of relapse from depression. Similarly, substantial evidence exists that mindfulness has a positive impact on anxiety disorders. Mindfulness practice plays an important role in cultivating enduring qualities, such as selflessness, equanimity, and impartial compassion. Research has shown that as you continue practicing, these become part of your way of being. They become traits. Poor sleep and sleep disorders are linked to a plethora of negative medical and psychiatric outcomes. Mindfulness-based interventions offer promise. Randomized, controlled trials have demonstrated a reduction in total wake time and decreases on the Insomnia Severity Index, a tool commonly used to assess for insomnia. Focused therapeutic ultrasound, non invasively beaming sound waves into brain tissue, oscillating superfast, open up the blood-brain barrier, clearing out toxic beta-amyloid clumps that are responsible for the worst symptoms of Alzheimer's. CURATED ARTICLES, VIDEOS ON MINDFULNESS, MEDITATION AND RELATED CONCEPTS. FOR THE MOST CURRENT PLEASE VISIT MINDFUL SYNC ON FACEBOOK. I WILL BE UPDATING THIS PAGE SOON. Is your workplace mindful or mindless? Sesame Street wonderful video - belly breathing with Elmo! Use this zen game to visualize or go to locations where you can experience a waterfront, city, dunes, lake, mountain, forest, blue sky. Sit comfortably or walk slowly. Read the breathing in and out lines with purpose and intent to see in a deep manner - first detail and then beyond the details of the subject. Feel the connection to the space. You can meditate in this way on all lines or even just use one set of lines, choose what feels best for you. Be in the present moment, fully aware and pause to reflect on what you see, hear, feel, sense. Enjoy! Here is the text for 'Waterfront'. If you are interested in the others please email me - daniel@meditationdj.com, and use this button below and the password provided.